Danny Dorling – 丹尼·道灵 » News » Britannia, Brexit and what now in the week before the April 12th deadline? Britannia, Brexit and what now in the week before the April 12th deadline? Danny Dorling speaking at the Cambridge Literary Festival, introduced by Cathy Moore, in the Palmerston Room, St John’s College, University of Cambridge, April 6th 2019 (the image shown here is of a protestor standing on one of the pillars of the gates of Blenheim Palace in 2018). 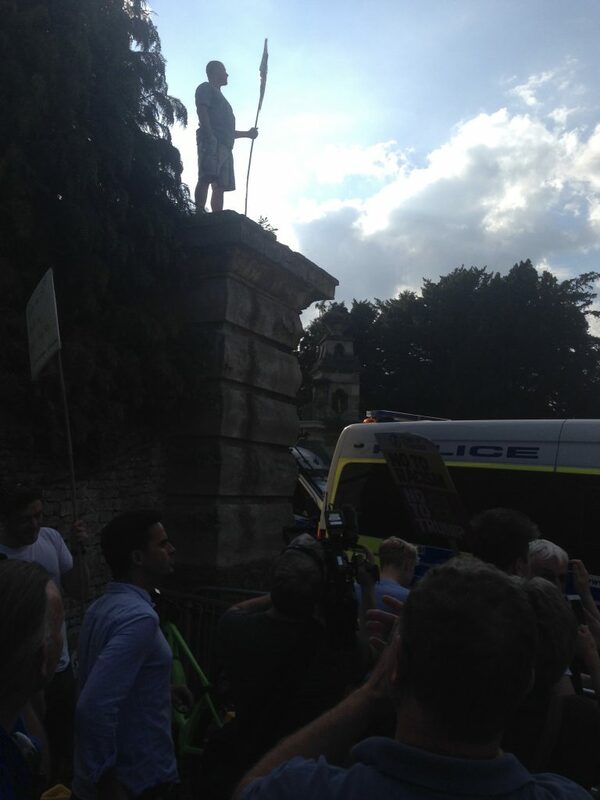 A protestor standing on one of the pillars of the gates of Blenheim Palace in 2018. “Whatever kind of Brexit occurs – hard, soft, or even a cancellation and staying in the European Union – Britain will be much diminished by the Brexit process. Already the British have lost face in a multitude of small ways. More additional money had to be found to pay for Brexit in the November 2017 Budget than could be found for the NHS.8 On the same day as that Budget, we also learnt that Britain would lose its special place on the International Court of Justice for the first time since the court’s inception in 1946. And for more on the book that the talk is based on click here.